I can’t log in or sign in. How do I reset my password? – Have a question? Find the answer here. 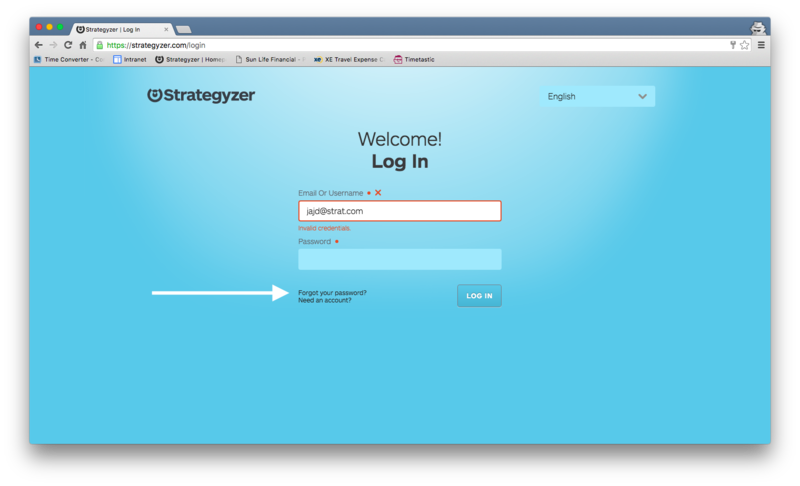 If you can't seem to log into your Strategyzer account, it could be because you're using a different email address other than the one used when the account was recreated. You can also try using your email address instead of your user name. A password reset email will be sent with instructions on how to proceed. The link provided will only be active for a short amount of time. If you do not receive an email, please check your spam folder. If you don’t remember your email address, try to find the Strategyzer welcome email you received during sign-up within your email accounts. Note: When you trigger the reset instructions more then once, only the newest reset instructions will work. If you fail to log in, please delete the old email and try the link again.